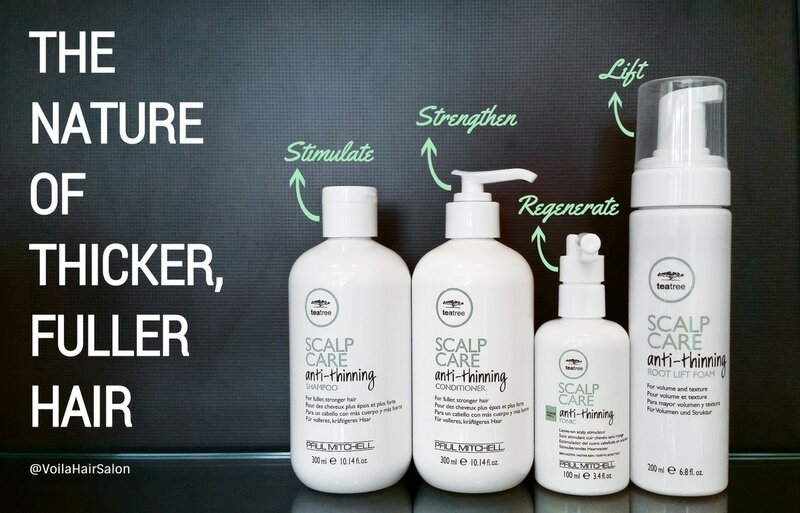 ​Tea Tree Scalp Care is a preventative system that gently and naturally helps slow down the process of hair thinning, due to breakage. Ideal for men and women, this color-safe daily regimen is infused with the exclusive Regeniplex botanical blend to promote optimal scalp health and encourage healthy, thicker hair. ​Whether it's due to aging, genetics, hormonal changes or other causes, hair thinning and loss can be worrisome and frustrating. Healthy hair and hair growth begins with a healthy scalp. Step 1: Helps block the shrinking hair follicle. Clover flower extract helps slow down the process of hair follicle shrinking and helps reduce hair fall. Step 2: Helps expand the follicle and strengthens the hair shaft. Kakadu plum, pea peptides, turmeric and ginseng moisturize and stimulate the scalp while increasing hair density and decreasing breakage. Step 3: Helps alter the growth pattern. The exclusive botanical blend helps extend the growth and rest phase of the hair cycle and shorten the cycle of hair fall resulting in fuller thicker hair. Exclusive Regeniplex blend contains Kakadu plum, pea peptides, clover flower, turmeric and ginseng and absorbs into the scalp to help stimulate and protect against breakage, resulting in fuller thicker hair. Shake well. Apply twice daily on towel-dried or dry hair. Part hair section by section and spray directly onto scalp in the center of the section. Avoid applying product directly onto the hair. Slide finger down the parting to distribute the tonic over the scalp. Do not rinse. Liquid-to-foam styler lifts hair from the root for a healthy boost of volume and texture. Features exclusive Regeniplex blend containing Kakadu plum, pea peptides, clover flower extract, turmeric and ginseng.